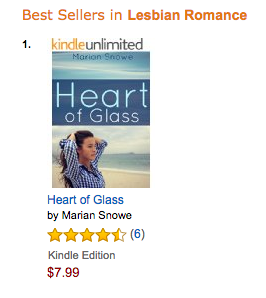 I was beyond stunned when my editor texted me early Wednesday morning to tell me that HEART OF GLASS has reached #1 on Amazon’s Best Sellers in Lesbian Romance list — and I’m still floating on a cloud. In all honesty, I never expected my first novel to be this popular. I adore HEART OF GLASS. I love the characters and the mystery and the chilly, mystic atmosphere of Wavestead, which has become like a daydream home for me. But I had so many doubts when I was writing it. Was it too slow? Was it as romantic as I hoped? Did the characters and their emotions ring true? From the reception it’s getting, I know at least that I’m doing something right. It’s an immense, immense confidence booster for a person who knows she needs to work on her confidence. I’m so humbled and delighted by the support I’m getting from friends and fans, and I’m so grateful that my editors introduced me to this world and are helping me through it every step I take. My heart is overflowing. I’m in the middle of writing a new novella, RESCUE ME. It’s about Elise, a woman who gets tongue-tied when she tries to speak to anyone she finds attractive, and Sasha, Elise’s beautiful and confident mentor at the marine animal rescue where they both work. Elise and Sasha embark on a rescue mission save a humpback whale who’s gotten tangled in fishing line. Along the way, as Elise tries to get her courage up to ask Sasha out, she learns some surprising things about Sasha’s past girlfriends. ‹ PreviousHEART OF GLASS is here! Next ›RESCUE ME has been released!